The role of photoinitiator is that after it absorbs ultraviolet light energy, the free radicals are generated through decomposition, thereby initiating the polymerization of unsaturated bonds in the system, and the cross-linking and curing become a whole. The commonly used free radical type photoinitiators have two types of cracking type and hydrogen abstraction type. 1) Pyrolysis photoinitiator Pyrolysis photoinitiators mainly include benzoin ethers (benzoin ethers), phenyl ketals, and acetophenones. The cracking type photoinitiator splits after absorbing ultraviolet light to generate two radicals, and the free radical initiates the polymerization of the unsaturated group. 2) The hydrogenation type initiator The hydrogenation type initiators mainly include benzophenones and sulfurthiones. Among them, sulfur-based photoinitiators have a maximum absorption wavelength in the near-ultraviolet region of 380-420 nm, and have strong absorption capacity and hydrogen abstraction ability, and have a high initiation efficiency. These initiators have excellent high-temperature stability and are also stable with epoxy resins, and are therefore widely used in cationic curing systems. However, their longest absorption wavelengths are in the far ultraviolet region and they are not absorbed in the near ultraviolet region. Generally, photosensitizers such as free radical initiators (Irgacure 117, 3184 and ITX) or photosensitizing dyes are added for sensitization. The photoinitiator of ferrocenium salts is a new cationic photoinitiator developed after diaryl iodonium salts and triaryl sulfonium salts. In the presence of light, ferrocene salt ions first form aromatic ligands, which simultaneously produce A complex of an unsaturated iron complex coordinated by an epoxy compound, this complex having the characteristics of a Lewis acid and subsequent formation of a complex coordinated to three epoxy compounds, one of which can be opened A cation is formed which initiates a cationic ring-opening polymerization to form a polymer. At room temperature, since ferrocene salt-epoxy complexes and epoxy compound cationic active species take time, external heating is required to increase the polymerization rate. 4 improve the performance of film and so on. UV curing adhesive additives are stabilizers, leveling agents, defoamers, plasticizers and coupling agents. Stabilizers are used to reduce polymerization during storage and improve storage stability of the resin. The commonly used stabilizers include hydroquinone, p-methoxyphenol, p-benzoquinone, 2,6-di-tert-butylcresol, phenothiazine, and quinone. The leveling agent is used to improve the leveling performance of the resin, prevent the occurrence of coating defects such as shrinkage holes and pinholes, make the coating film smooth, and can improve the glossiness. Mixed solvents, silicones, polyacrylates, cellulose acetate butyrate, nitrocellulose and polyvinyl butyral are all effective leveling agents. Defoamers are used to prevent and eliminate the bubbles produced during the manufacture and use of the coating and prevent the coating from producing pinholes. Phosphates, fatty acid esters and silicones can all be used as defoamers. There are interaction forces between linear macromolecules. This force comes from van der Waals forces and hydrogen bonds, and its size is related to the structure of the polymer. This interaction can affect many properties of the polymer. The role of plasticizer is to weaken the interaction between the polymer molecules, thereby increasing the flexibility of the rubber, relaxation of internal stress, thereby increasing the impact strength of the glue; reduce the softening temperature and glass transition temperature of the film, improve the low temperature resistance Reduce the viscosity of the polymer, increase its fluidity, thereby increasing the adhesion of the adhesive to the adhesive surface and improving the bonding strength of the joint. Coupling agents are a class of substances that have amphoteric structures. Some of their molecules can react with the chemical groups on the surface of inorganic substances to form a strong chemical bond. The other part of the groups have the properties of an organophilic organic compound. Molecular reaction or physical winding, so as to firmly combine two materials of different sizes. The coupling agents currently used in the industry are classified into four major categories based on their chemical structures: silanes, phthalates, zirconiums, and organic chromium complexes. Among them, silanes are widely used in uv curing adhesives, such as Î³-methyl acrylate trimethoxy silane (KH-570), Î³-aminopropyl triethoxy silane (KH-550), and the like. In short, the current research on UV curing technology has received widespread attention from people. Its rapid development has also attracted the attention of all industry circles and has made remarkable achievements in the development and application. Among them, UV-curing adhesives have also made breakthrough progress. Now they have been used in various fields such as medical and health, aviation, electronic assembly, printing, optical instruments, packaging, information, military defense, glass products and daily life. In the 21st century today, people have increased their awareness of environmental protection and energy conservation. Green industrial products, UV-curable adhesives, will surely achieve greater development. However, at present domestic research and development and application of uv curing adhesives are still relatively backward. 1) Only a few companies in the domestic hundreds of adhesive production units produce UV-curable adhesives. Although some studies have been reported in the literature, few have actually gone to industrial production. Therefore, its industrialization process needs to be developed and researched, and the scale of production needs to be expanded. 2) The research of domestic UV-curing adhesives started late, so there is a big gap with foreign countries in areas such as research, development, production, and application. Therefore, the intensity and depth of research and development need to be increased in this attractive area. The paper and plastic packaging bags are usually composed of two sides, one is the paper that passes through and discharges the sterilization factor, the other is the tonguing composite film (plastic film) that cannot permeate the liquid, air and gas, and the tonguing composite film consists of at least two layers (polypropylene inner layer and polyester outer layer). The exchange of air disinfection factors is carried out on one side of the paper. 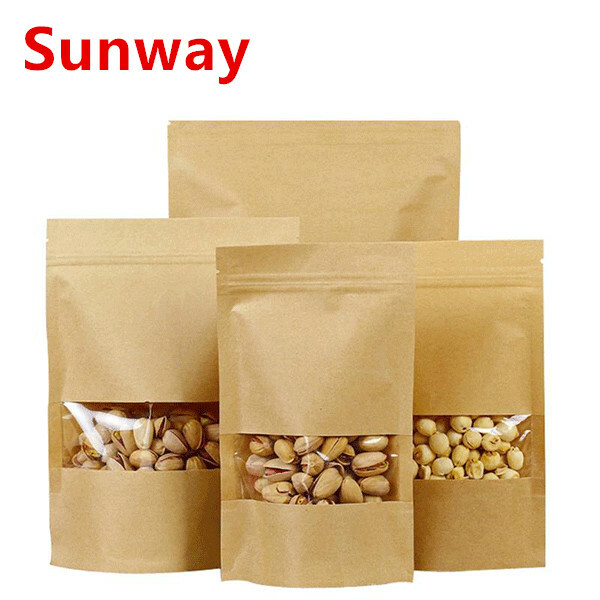 Due to the data, it also has the outstanding function of microbial barrier, and makes the package visible to the goods in the package, High quality Craft Paper Bag with window is made of food-grade material 100% , and you can pack the food safely.